Join us October 5-7, 2016 for the 7th annual Digital Media and Learning Conference. This international gathering brings together a vibrant and diverse community of innovators, thinkers, and progressive educators to delve into leading-edge topics in digital media and learning. We build connections across research, design, and practice in the service of progressive, equitable, and youth-centered approaches to learning with technology. 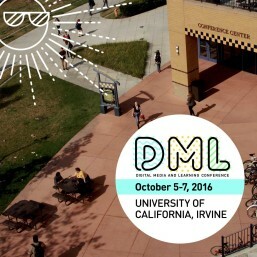 DML2016 will be held at the sunny University of California, Irvine campus and will feature a new in-depth workshop day, as well as two days of general sessions filled with opportunities to build, ask, share, and invent. We hope you can join us! 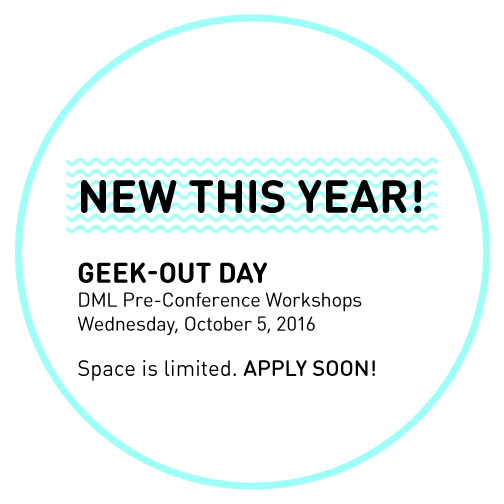 An all new conference “geek out” day offers deep dives into hands-on workshops, mini-courses, and working sessions with top experts in the field. Topics range from courses in media making, learning analytics, program evaluation and game design to working sessions focused on delving into cutting edge problems in research and practice. Applications for workshop participation are due July 4, 2016. Click here to access full descriptions, schedule, and process for applying. 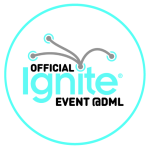 Ignite Talks are fast-paced five-minute talks on any DML topic of the speaker’s choosing. Apply Here. For the two main conference days, we will be accepting proposals in the following formats: General Sessions; Individual Presentations; Structured Poster Sessions, and Ignite Talks. We invite proposals in a range of genres, including research papers, sharing of compelling models, and hands-on sessions. General Session proposals are for full 90-minute sessions on a focused topic or perspective. Panel sessions typically include four participants on a panel presenting research papers or describing a related set of projects or programs. General session proposals can also be organized as hands-on and interactive workshops. Individual Presentation proposals are for individual 10-minute presentations. These can be research papers or presentations of projects, designs or programs. The conference committee will select a limited number of individual presentations, which will be grouped into 90-minute sessions of four or five presentations, with time for discussion. Thematic Poster Session proposals are for 90-minute sessions that include poster presentations on a shared theme. Proposals should include at least 5 poster presenters, and other presenters might be added by the conference organizers after acceptance of the session. Thematic Poster Sessions start with rapid-fire presentations for the audience to hear from all presenters, followed by time to circulate among the posters for in-depth discussion and conversations. Sessions conclude by convening the entire group, and organizers can designate a discussant to wrap-up. * Complete the form below to apply. * General Session proposal abstracts: please describe your presentation in 500 words or less. * Group Structured Poster abstracts: describe your talk in 500 words or less. * Individual Presentation and Individual Structured Poster abstracts: describe your talk in 250 words or less. * Pick a format category: Research, Project Presentation, or Hands-On/Interactive. * List of participants, affiliations, emails, and titles of talks/presentations (if applicable) should also be included. * All conference rooms will be equipped with standard Wi-Fi broadband service, AV projection, and sound. You will need to provide your own laptop and VGA adapters. We will not be providing additional bandwidth capacity or special arrangements. * Each applicant will be limited to participation on no more than two panels at the general session. * Accepted participants will be expected to pay for conference registration, and to fund their own travel and accommodation.